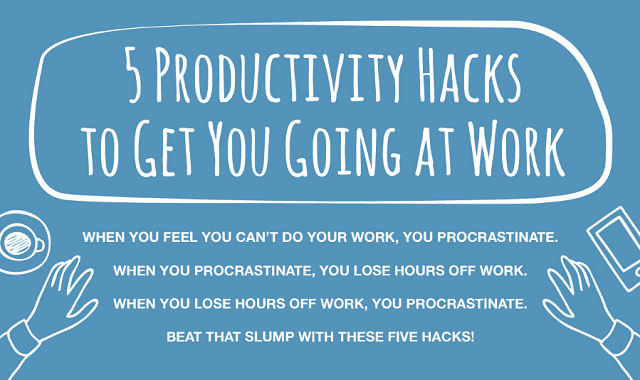 5 Productivity Hacks to Get You Going at Work #Infographic ~ Visualistan '+g+"
Let’s admit it, there are down days in the office, times when we force ourselves to work but just can’t. Sometimes you’ll find yourself dreaming about a vacation while sometimes you’ll experience a major creative block, making you procrastinate. Occurrences like this leaves you with an empty blank stare and a certain feeling of inadequacy. Don’t worry about it. Unproductivity happens to everyone, even to CEOs. However, occasions like this should lessen, especially when they begin to waste precious time and money. Apart from putting your career into jeopardy, it also makes your business lagging and inefficient. Learn how to battle unproductivity (even when at your work desk) through this infographic from SlideGenius. From fighting laziness to handling distractions, this infographic will show how productivity reaps fun and effectiveness for everyone. Keep them in mind and share them to your colleagues for a faster and better work output. Check it out below.